Dr Carey McClellan, a specialist physiotherapist in emergency care and founder of getUbetter, is in the first cohort of graduates from the West of England AHSN’s Healthcare Innovation Programme. The programme, which first ran in April 2015, delivers coaching, mentoring and support for entrepreneurs and develops the next generation of healthcare innovators. Carey developed a suite of apps to help patients self-manage their recovery from injury. The SMARTapps are unique -they aim to bring healthcare to users 24/7 and promote self-management. The apps guide recovery from injury day-by-day and step-by-step and can be used with or without seeing a health professional – putting users in control. The apps do not just provide simple information or exercises, they provide: personalised information, that responds to how how users are feeling and is relevant to the time point of their injury. The app can connect users to the health system and suggest where and when to seek help if needed. getUbetter’s aim is to empower people to understand and trust their recovery, promote self-management and let people know what is normal, what to expect and how to get better. He attended the three day course in Bath to help take his business forward. Attending the course helped Carey broaden his skills in talking about the benefits of his product and getUbetter launched the first app in December 2015 for self-management of lower back pain. It takes the user step-by-step through every stage of recovery, whilst putting the patient in control. 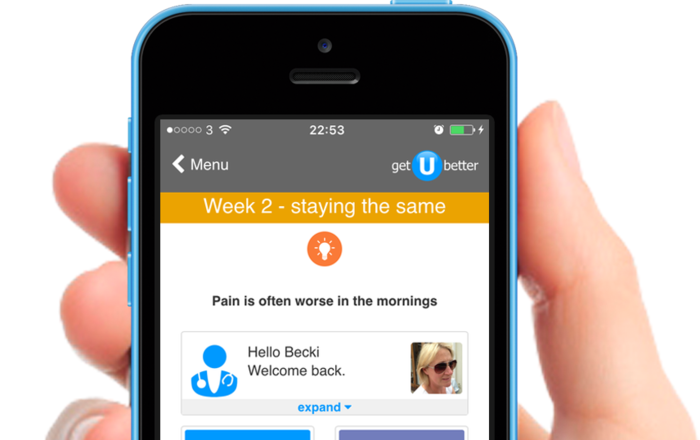 getUbetter plans to launch a range of apps for ankle, shoulder and knee injury later in 2016.